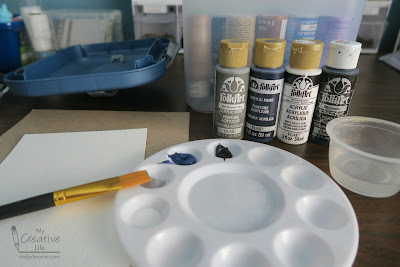 I'm sharing two painting projects in a row, but they couldn't be more different. 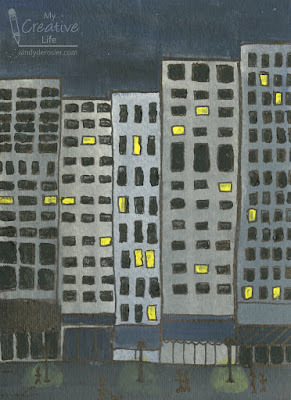 Yesterday's subject was a colorful daytime scene of a stunning natural wonder, while today's is a cityscape at night. 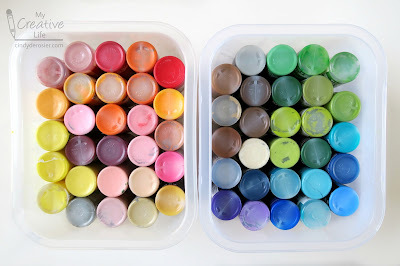 Put paint in the palette and water in a cup. Select a wide brush. 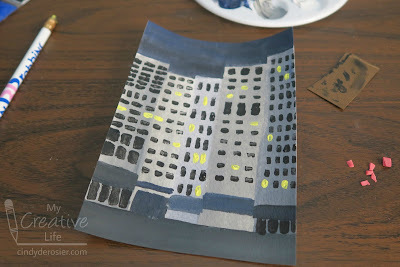 Cut the watercolor paper so it is the size of a postcard and orient it vertically. 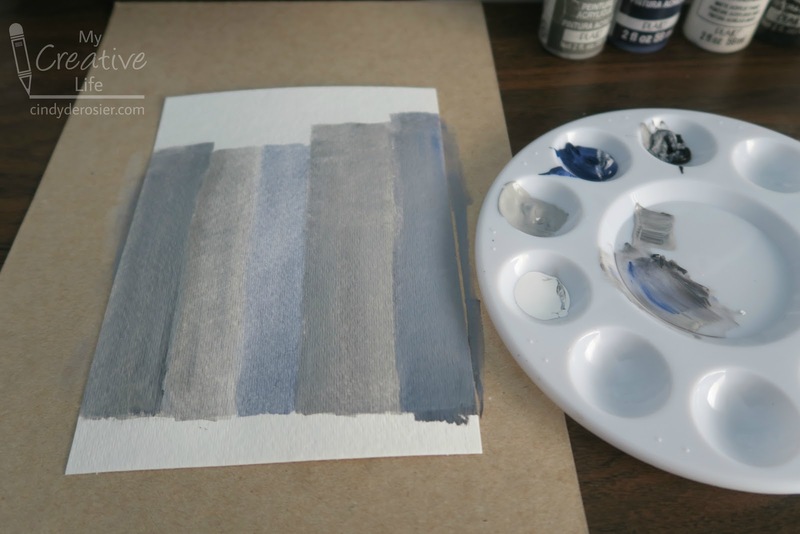 Blend the paints to create five different shades of gray and paint them on the paper with a wet brush. These will be the buildings. I left white space for the sidewalk and the sky, but that's not necessary since they're both darker than the colors of the buildings. Mix gray and black to create the color of the sidewalk. Mix in Thunder Blue for the sky. You can stagger the heights of the buildings for interest. 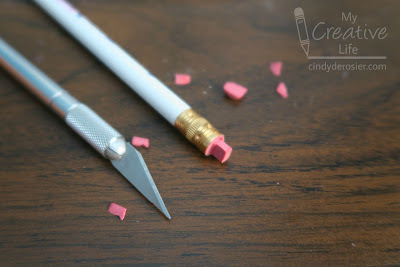 Use a craft knife to carve an eraser into a rectangle. 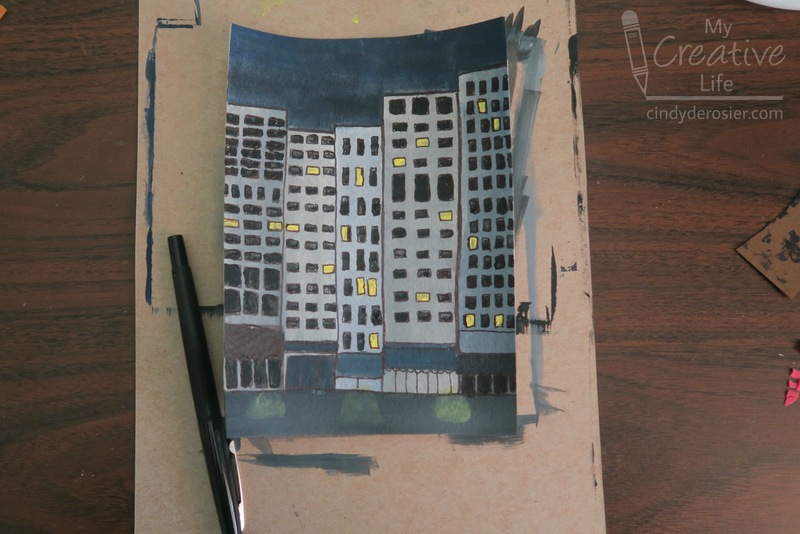 Dip the eraser into black paint and stamp windows onto the buildings. Vary the windows on the different buildings by stamping horizontally and vertically. You can stamp twice to create a larger window. Leave some blank spaces to make the lighted windows. Clean your homemade stamp by washing it under running water and blotting it on a paper towel. 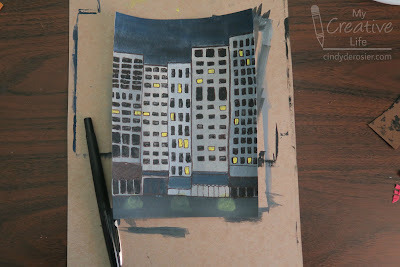 Then dip it into yellow paint and stamp in the remaining windows. Use a small brush to add bands of gray to the lower parts of the buildings to represent awnings or signs. Water down some yellow paint and add blobs along the sidewalk. When the paint has dried completely, use the flair pen to outline the buildings, windows, doors, and awnings. 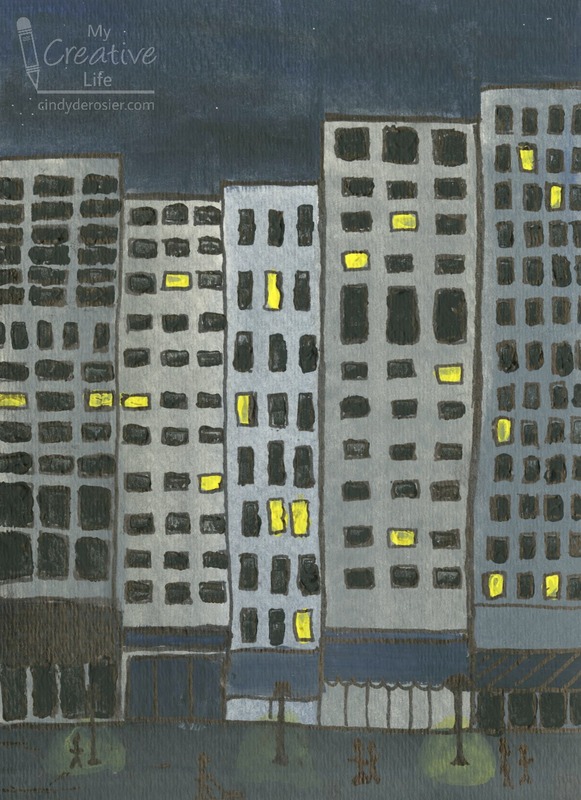 Draw street lamps in the center of each of the yellow blobs, then add the rough shapes of people walking by. This is a great project to do with kids, but can be difficult for those who struggle with perfectionism. It's nearly impossible to line up all the windows perfectly, for example, and that's OK. It's not an architectural drawing. 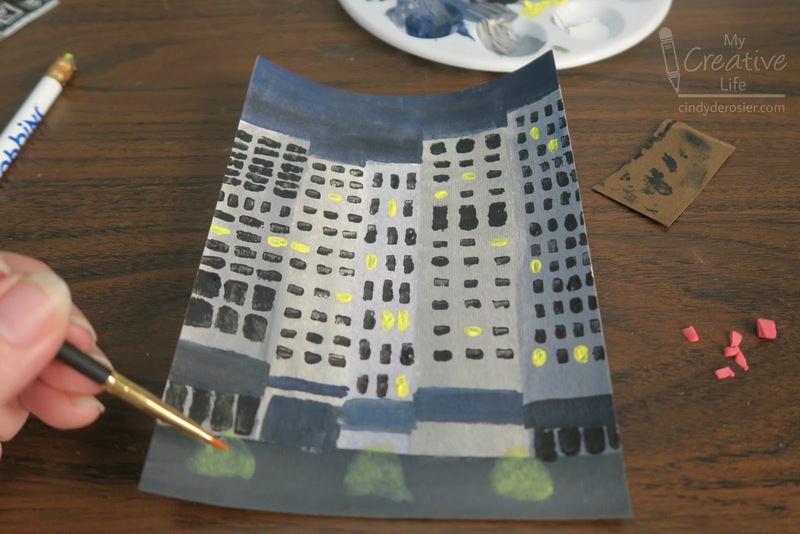 For students who focus too much on perfection, challenge them to intentionally draw wavy lines and crooked buildings. Dr. Seuss made a whole career out of imperfection! One of my goals for the year is to design more state-inspired crafts. I'm still missing a few states, including Wyoming. When I think of Wyoming, the first thing that comes to mind is Yellowstone. I've never been to Yellowstone, but will make it there someday. And when I do, the Grand Prismatic Spring is at the top of my must-see list, along with Old Faithful, of course. 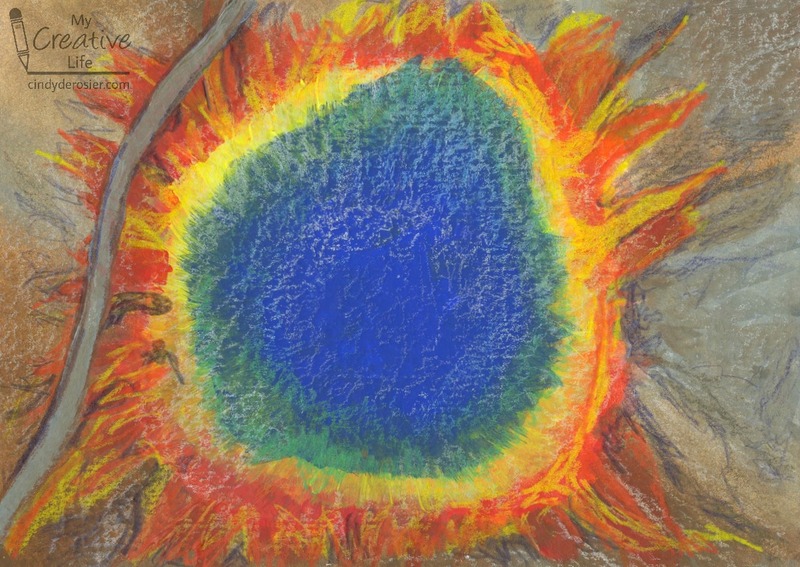 I'm fascinated by the science behind the colors of Grand Prismatic Spring, as explained in this article. It's so beautiful in photos, and I can only imagine how much more spectacular it would be in person. It is perfect for my first Wyoming-inspired project. 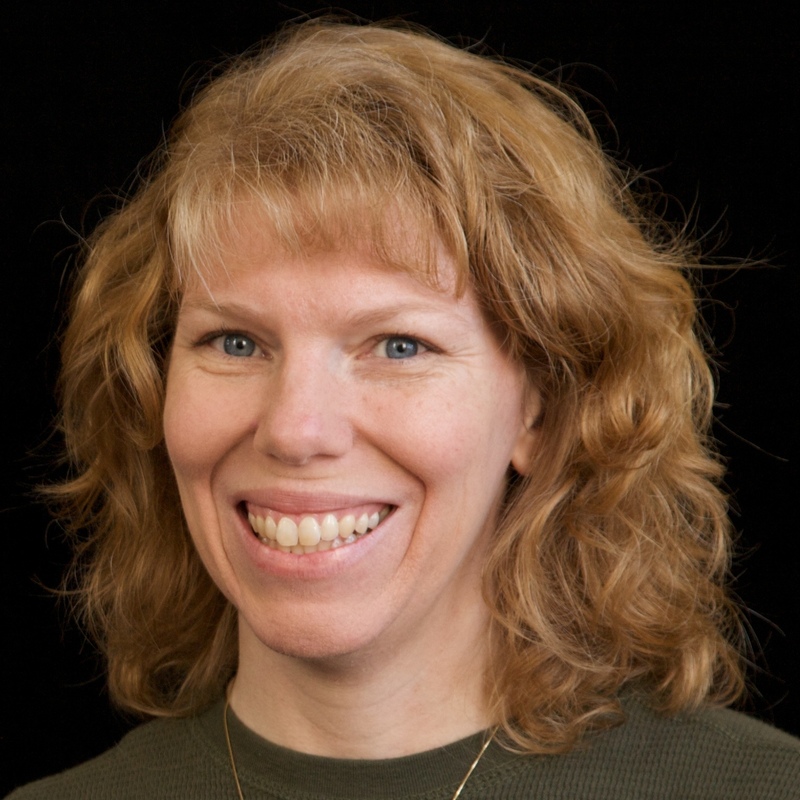 Affiliate links below. I cut my watercolor paper to the size of a postcard, but you can make your artwork whatever size you'd like. 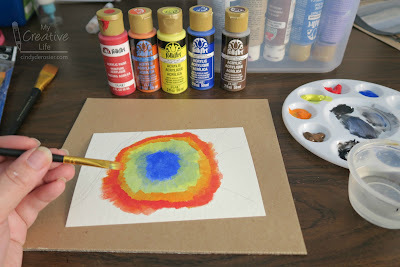 With a wet brush, paint a bullseye (of sorts) starting with blue in the center, then yellow, then orange, then red, pulling the paint outward from the center. Don't clean the brush between colors. You want them to blend. 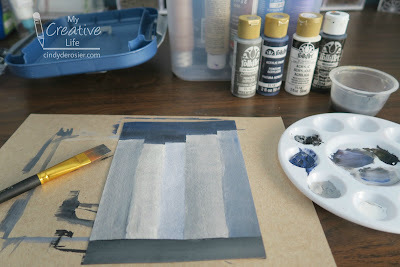 Fill in the outside area with browns and grays. Clean the brush and let the paint dry. Use the reference photo to adjust the size and shape of your color bands, starting with the blue and working out. When you get to the oranges and reds, pull them out over the browns and grays. Let the paint dry. Add the observation path along the left of the painting. Now it's time for the colored pencils. Lightly color light blue highlights around the edges of the blue, then add light green. Highlight the yellow. 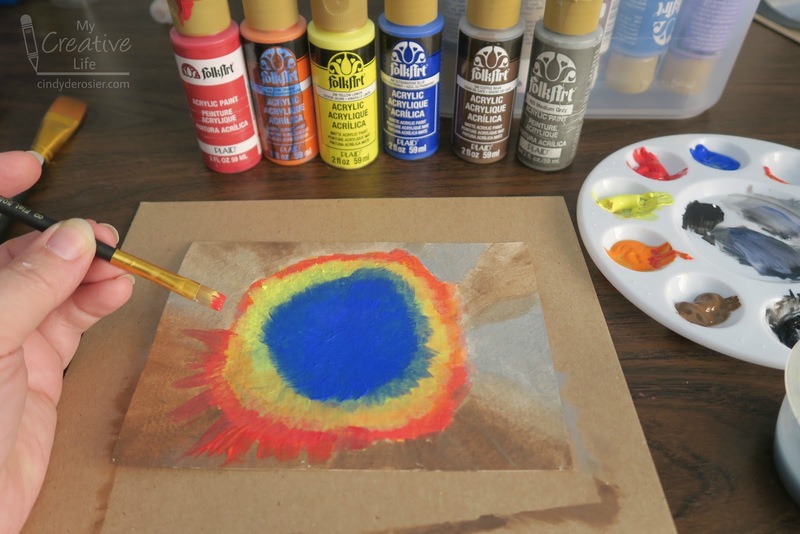 Use the reference photo to mimic the colors of the orange, red, and brown organisms. Outline the observation path. 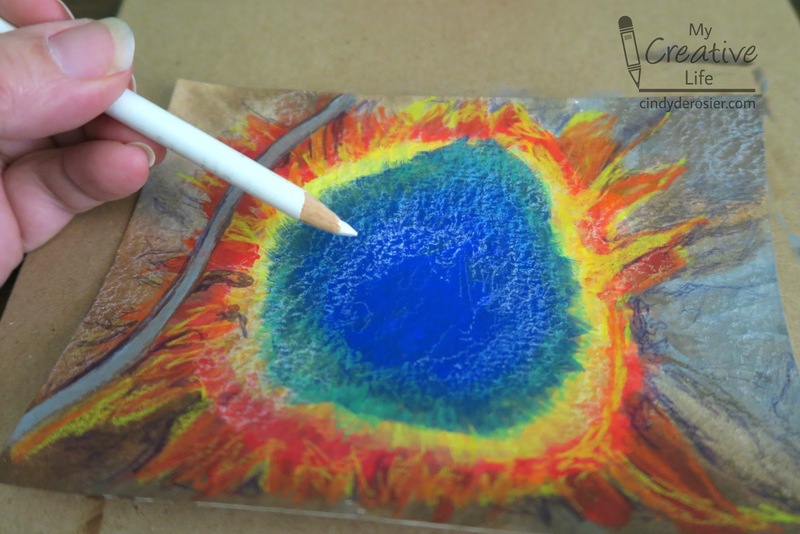 Finally, use the white colored pencil to swirl color gently over most of the painting, leaving only the center uncolored. This will help blend the colors and mimic the steam. 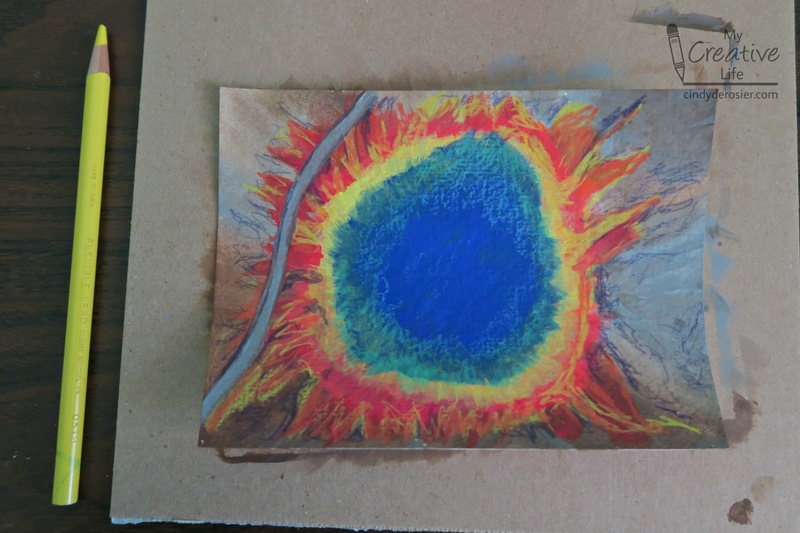 When I do eventually make it to Yellowstone, I think I'll bring my postcard-sized art along, add a stamp, and mail it to myself from the park. That would make a neat souvenir. I am on a roll! 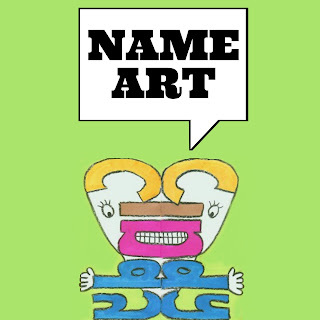 I've finished indexing another category of crafts, Name Art. I am so happy to have it all in one place. I'm totally in the mood to do more name art. Hopefully I'll have a new project or two to share with you soon. I moved all the specialty paints in separate Sterilite Show-Offs. Most are upside down, marked with a Sharpie so I can easily tell what type of paint is each is. 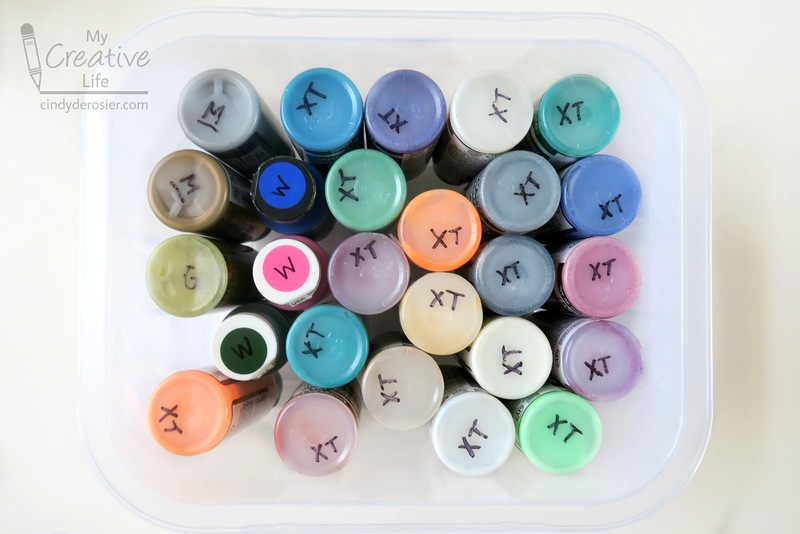 XT stands for Extreme Glitter Paint, my favorite way to add tons of ultra-fine sparkle to a project. W is for Watercolor and they're so pretty. M is for Metallic. These go on so well and provide great shine. I have more specialty paints in larger ClearView Latch Boxes. There's a photo of one of the tubs below. The paints with the printed design on the top are the Multi-Surface paints. E is for Enamel, F is for Fabric, and P is for Pickling Wash. CS is for Color Shift, one of my favorites of Folk Art's specialty paints. My budding collection of Glitterific is in another, along with the newly-released Dragonfly Glaze. 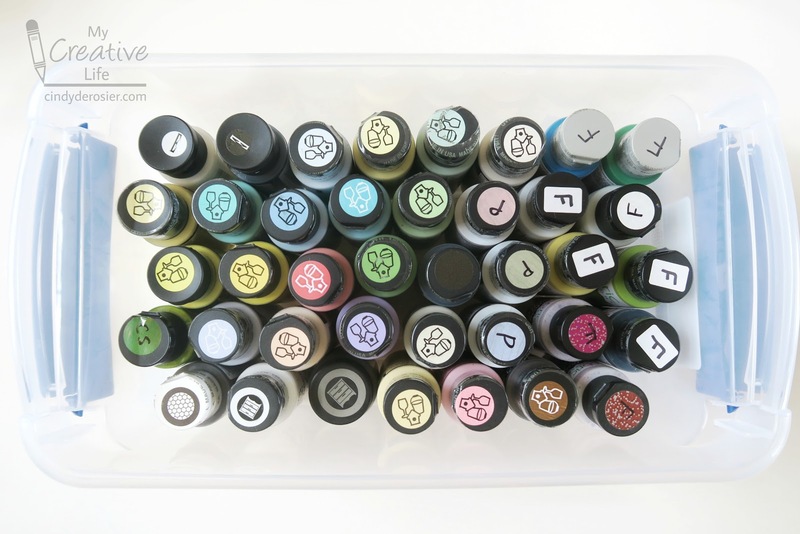 So far, I'm really liking the way I've organized my paints. 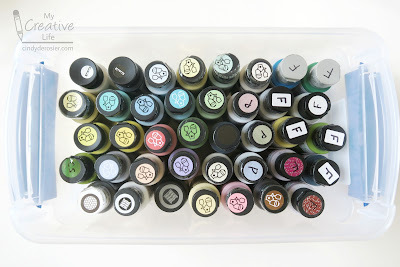 How do you store your paints? I'd love to hear! My project was inspired by this card. I love the way the words of John 11:25 were arranged to form a cross. 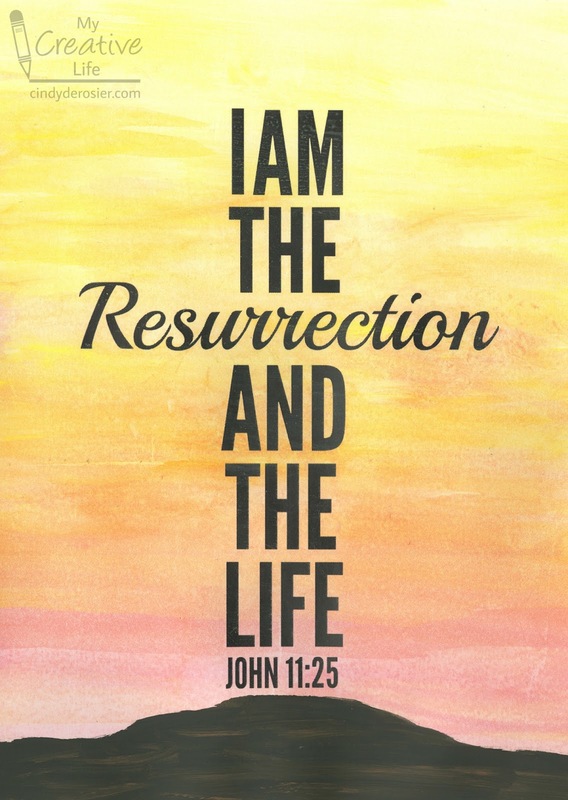 I'm not sure whose idea this originally was, as a quick search shows that many people are selling projects featuring the text of John 11:25 written in the shape of a cross. There are elements I like about each of the designs, as well as things I don't. 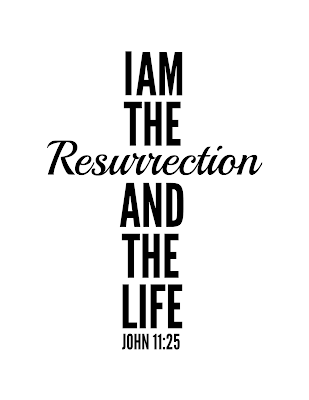 For example, some of the crosses are actually plus signs (with three words above 'Resurrection' and three words below). I like the cross bar higher. I like the emphasis to stay on the verse and not get lost in embellishments. 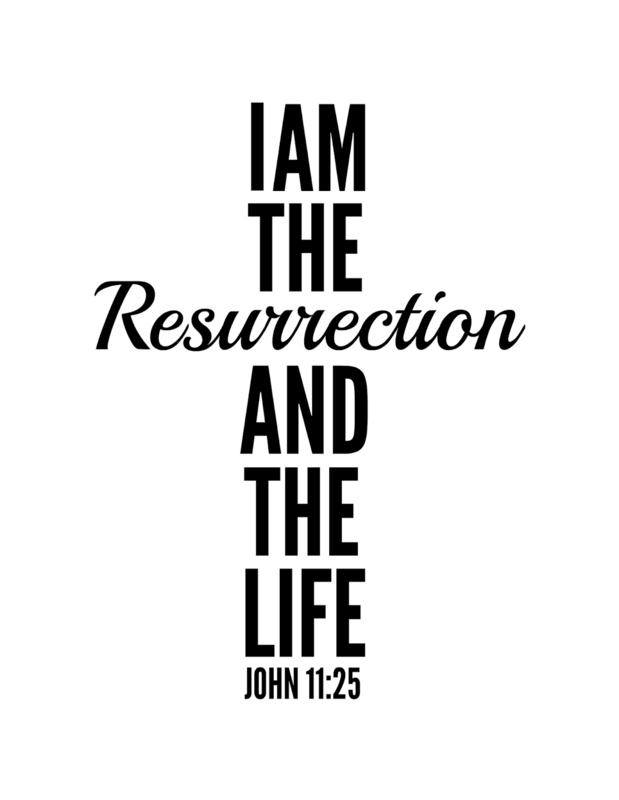 I like the words to actually create the cross without having to outline it. I printed it on heavy paper, then used watered-down Folk Art paint to make the sunrise. 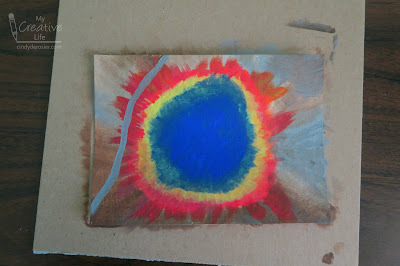 When that was dry, I painted the hill the cross sits on. I love it. "The Most ____ from Each of the 50 States"